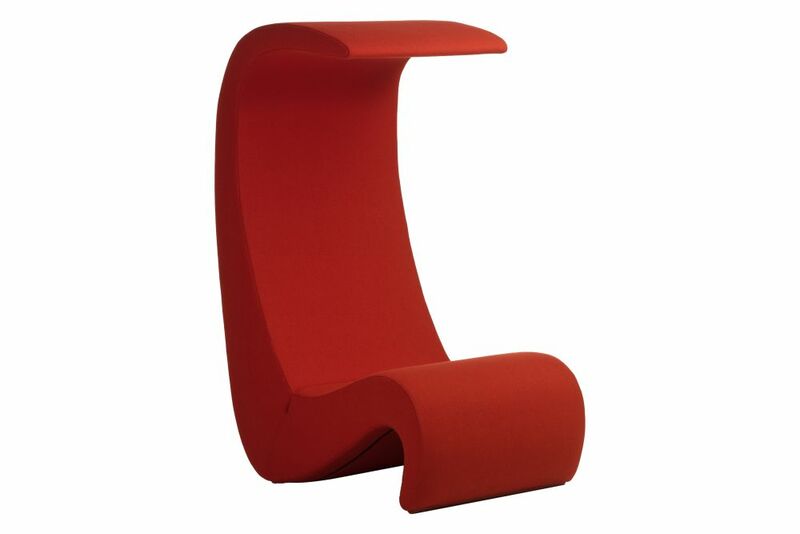 Verner Panton designed Amoebe Highback as a variation of the Amoebe chair. The expressive, high backrest of Amoebe Highback extends forward to form a roof-like structure, enveloping the sitter with a sense of protection and shelter. Verner Panton, born in Gamtofte, Denmark, studied at Odense Technical College before enrolling at the Royal Danish Academy of Fine Arts in Copenhagen as an architecture student. He worked from 1950-1952 in the architectural firm of Arne Jacobsen and founded an independent studio for architecture and design in 1955. He first attracted wider attention with the geometric forms of his furniture designs for the firm Plus-linje. In the following years Panton created numerous designs for seating furniture and lighting. Verner Panton's passion for bright colours and geometric patterns manifested itself in an extensive range of textile designs. By fusing the elements of a room – floor, walls, ceiling, furnishings, lighting, textiles and wall panels made of enamel or plastic – into a unified gesamtkunstwerk, Panton's interior installations have attained legendary status. The most famous examples are the 'Visiona' ship installations for the Cologne Furniture Fair (1968 and 1970), the Spiegel publishing headquarters in Hamburg (1969) and the Varna restaurant in Aarhus (1970). Panton's collaboration with Vitra began in the early 1960s, when they jointly developed what became his best-known design, the Panton Chair, which was introduced in 1967. This was also the first independently developed product by Vitra. Verner Panton died in 1998 in Copenhagen. Vitra's re-edition of designs by Panton, as well as the retrospective of his work mounted by the Vitra Design Museum in 2000, bear witness to the special relationship between Vitra and Verner Panton.